So many refining companies running efficient operations is taking a toll on refining margins and the stock prices of HollyFrontier Corp., Alon USA Energy Inc., PBF Energy Inc., and CVR Refining LP. 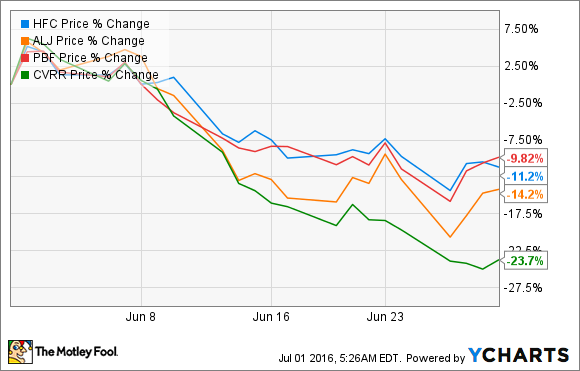 What: After taking a large tumble in May because of rising oil prices, independent oil refiners had another rough month. Shares of HollyFrontier (NYSE:HFC), Alon USA Energy (NYSE:ALJ), PBF Energy (NYSE:PBF), and CVR Refining (NYSE:CVRR) all saw declines of 10% or more in June. HFC, ALJ, PBF, CVRR data by YCharts. So what: The reason that the three oil refiners' shares have tumbled for the second straight month is that, like last month, refining margins haven't been as robust as they were this time last year. According to the most recent refining margin report from Scotia Howard Weil, the two refining margin indicators that are most pertinent to these four companies -- Chicago and the Gulf Coast -- stood at $16.10 and $11.33 per barrel, respectively, on a quarter-to-date basis. This is well below the results from the same time in 2015. To be fair, though, refining margins in 2015 were some of the best they have been in decades, so it was a very high hurdle to jump over. There is one particular trait keeping refining margins rather low, and that is high utilization rates from refiners. Utilization rates are the amount of crude processed, divided by the total capacity of the facility. For an individual refining company, you want this number to be as high as possible because it means the company is running an efficient business. If every refiner is able to run at high utilization rates, though, it typically means there is a bit too much gasoline and diesel supply to go around. If you look at the utilization rates of these companies in the past quarter, they show companies that are doing good things individually, but aren't really helping the refining market get back to more robust margins. CVR Refining saw even larger losses in the quarter because it has been forced to reduce operations at its Coffeyville refinery. A refined product pipeline between the refinery and Kansas City -- run by Magellan Midstream Partners -- was shut down on June 7. That pipeline reduced the takeaway capacity from the facility by about 30,000 barrels per day and is expected to be down for about four weeks. This reduction in production will likely put a dent in the company's second-quarter results, but it's a temporary thing and probably won't be much of an issue beyond that. Now what: All of these companies are in an odd position. They have been operating at a high level with great utilization rates, but all these companies running at high rates also means that they are reducing their own profit margins. Ultimately, though, things like refining margins eventually come out in the wash, and today's lower refining margins may not mean much over the very long term. Going forward, investors should continue to watch that all of these companies keep up strong operational results and keep costs down. One thing to note in particular: PBF Energy recently purchased a refinery in Torrence, California from ExxonMobil. The refinery has been riddled with issues over the years, and so far ExxonMobil hasn't put together the four weeks of uninterrupted operations required for the transfer of assets. When it does, though, PBF will face an uphill battle in getting this facility up to par with its others. Can Alon USA Energy Beat These Numbers?